Dudley Warner Woodbridge began teaching at William & Mary after receiving an A.B. in 1922 and Juris Doctor in 1927, both from the University of Illinois. He served as the acting dean of the School of Jurisprudence from 1942-1946 while Theodore Cox served in the army during World War II. In 1948 Woodbridge was once again asked to serve as the acting dean, and was ultimately appointed Dean of the School of Jurisprudence in 1950. 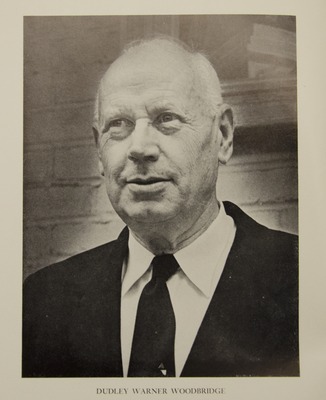 Woodbridge was at the helm when the Department of Jurisprudence became the Marshall-Wythe School of Law in 1953 and retired from his responsibilities as Dean in 1962. He would go on to teach until 1966. For more than 30 years Dudley W. Woodbridge was the editor of the Virginia Bar Notes that supplemented the Richmond Bar Review. The 1968 Edition of the Virginia Bar Notes is available here. Dudley Woodbridge's publications are available here.